This week we begin a three episode series on the underwater war at sea, and that means a lot of discussion about U-boats. It has been a long time since we talked about U-Boats, Episode 59 by my count and in that episode we left off the story with the end of the unrestricted submarine warfare campaign of 1915. Since that was almost two years ago, lets do a super quick refresher. This week we begin a three episode series on the underwater war at sea, and that means a lot of discussion about U-boats. It has been a long time since we talked about U-Boats, Episode 59 by my count and in that episode we left off the story with the end of the unrestricted submarine warfare campaign of 1915. Since that was almost two years ago, lets do a super quick refresher. In 1914 the Germans had a reasonable collection of U-Boats which they planned to use as commerce raiders during the war. The initial plan was to use the already existing cruiser rules for commerce raiding. For submarines this meant surfacing, notifying the merchant ship of what was about to happen, getting everybody off the ship and to safety, and then sinking it. The British were not a big fan of having their merchant ships sunk and so they started to set traps for the U-Boats and also began to arm the merchant vessels. This posed some problems for the U-Boats who were already giving up their greatest strength, their ability to operate underwater, when they surfaced to notify a ship that it was about to be sunk. This pushed the Germans to begin an unrestricted campaign where the U-Boats would sink ships on sight anywhere around the British Isles without taking the time to notify them. This then made the Americans a bit angry, and after the sinking of the Lusitania, where several Americans died, the Germans were forced to call off their campaign due to pressure from the United States. That is where our story today begins. We will discuss a bit about the aftermath of the unrestricted campaign before moving into 1916 where we will discuss some of the changes to German policy and tactics during that year. The last half of this episode will focus more on topics than events as we look at submarine and anti-submarine technology during the war and how it evolved. We will then close out this episode by discussing the mental strain that the U-Boat crews were under during the war and how they tried to cope. All of this episode is really just a lead in to the next two episodes which will be spent almost entirely on the second unrestricted submarine campaign of the war, and its effects. Also, after several months of having different intro and outro music we are back to being on our way to Tipperary, and if you do not know why this song is appropriate for episodes about U-Boats, then you should go watch Das Boot. Don't worry, I'll be here when you get back. 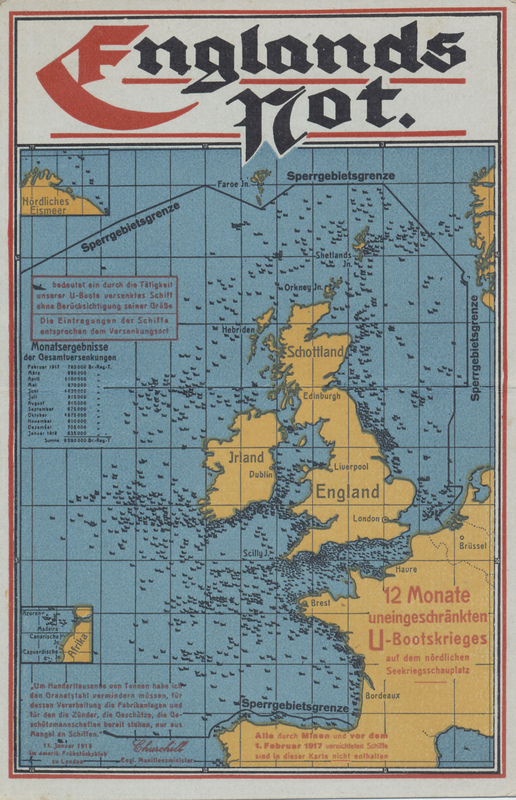 After the first unrestricted campaign came to an end, and the U-Boats were withdrawn from the Atlantic and North Seas, they were assigned to work with the High Seas Fleet for the next few months. The change in role for the subs, removing them out of the public eye, caused an interesting change in American public opinion. Both sides constantly had their eyes on American public opinion and in late 1915 they both noticed a slow movement towards concern about the British blockade of Europe. Remember that the British were blockading not just Germany and Austria-Hungary but also all of the neutral countries of the world from trading with Germany, or anybody inside of their continental sphere of influence. With the removal of the unrestricted submarine campaign this became the greatest violation of neutral rights during the war. However, while these feelings were present, and growing, they were not as strong as the Germans believed them to be. By the end of 1915 there were many within the German government that believed that American public opinion had turned so strongly against the British that they would not want to enter the war against Germany even if they began a new unrestricted submarine campaign. Back in episode 106 we discussed how difficult the war had been on the German home front, almost entirely because of the blockade, but it would only be in late 1915 when this began to really hurt. This caused German public opinion to move decisively in the direction of another unrestricted campaign, especially since all they had to look at was food shortages and the British blockade, with the German Navy seemingly powerless to fix either issue. With the threat of an American response seemingly gone and the greatest downside of an unrestricted campaign removed some members of the German Navy, particularly Admiral von Holtzendorff, Chief of the Naval Staff, and Admiral von Scheer, at this point commander of the High Seas Fleet, began to slowly gather support for a new unrestricted effort. For the time being though, the civilian government led by Bethmann-Hollweg, was able to prevent this from happening. While these decisions were being made the conflict between Germany and the British over the usage of submarines went beyond just the military realm, extending into the newspapers as well. The North German Gazette would post in early February that ‘armed British merchantmen have an official order to treacherously attack German submarines wherever they meet them; that means, to mercilessly wage war against them.’ While The Times would respond by saying that Germans were protesting 'against merchant ships having any means of defence against submarines, despite the fact that these German instruments of war, contrary to every usage of the law of nations… had for months shelled innocent merchant ships without notice or pity.' While so much of these discussions were focused around unrestricted submarine warfare, this was not entirely a binary choice between unrestricted or none at all, there were many shades of grey that the Germans could elect to pursue. They would choose one of these to begin on March 15th. On this date they began a new restricted campaign which would revert back to the old Prize regulations from before the war, however they introduced some caveats into these rules. The submarine captains were completely forbidden to sink passenger ships, which would hopefully keep the neutrals happier but this did not include any ships making their way into English Channel ports at night. In fact anything navigating into the Channel ports at night was considered fair game. By giving the U-Boat captains just this small bit of wiggle room the government allowed them to capitalize on this ambiguity and run with it. This would all come to a head on March 26 when the cross channel steamer the Sussex was torpedoed and sunk by a German submarine, resulting in 50 deaths and many injured, including some American citizens. This ship was sunk by the UB-29, a small UB-Type submarine which the Germans often used in the English Channel. Many of these smaller boats were commanded by young and inexperienced junior officers, and the crew of the UB-29 fit into this category when on the afternoon of March 24th they spotted the Sussex. The U-Boat closed to 1,400 yards and then torpedoed the ship resulting in damage to the bow section of the Sussex. The ship did not sink, and instead was able to be towed back to Boulogne which was great for the rest of the passengers but complete rubbish for the Germans. There were still fragments of the torpedo inside the ship and the Germans were conclusively blamed for the incident. The reason that this was important was because it was easy for the Germans to at times blame mines for the sinking of ships. There were many such mines floating around the seas between the Channel and the North Sea and one hitting a civilian ship was in no way unheard. In this case though, they would not have any possible excuse for what happened. The sinking of the Sussex would cause outrage in America far in excess of what was probably deserved from the incident given the small number of Americans who were injured. After the American government had confirmed that it was in fact a German submarine which had sunk the ship they were also quite unhappy. 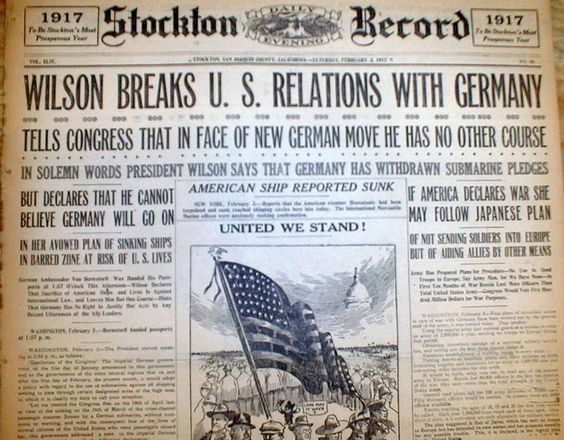 Wilson would send a note to Germany on the subject and G.J. 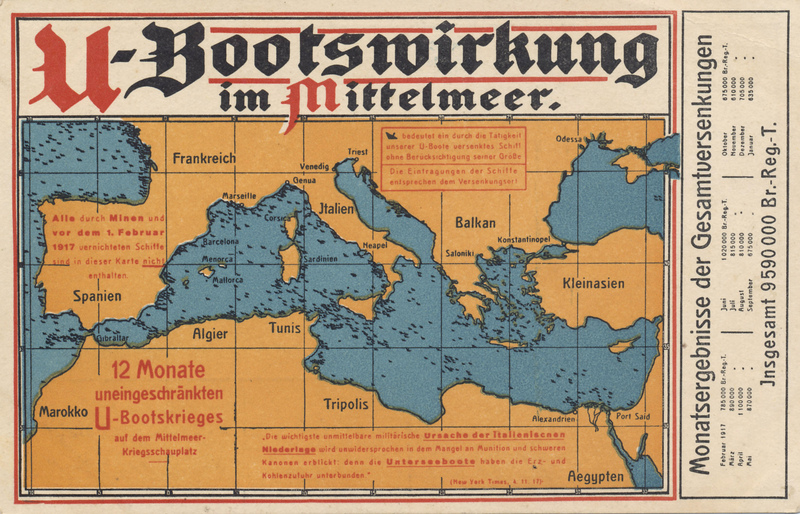 Meyer from A World Undone discusses some of the content "It demanded that Germany recognize the right of American citizens to travel in safety on the ships of nations at war, and that it abandon its U-boat campaign or face a severing of relations. It invoked, in terms by now familiar to Berlin, “sacred and indisputable rules of international law and the universally recognized dictates of humanity.”" This ultimatum was sent on may 15th. When the German Foreign Minister Jagow received the message he would say in response that they wanted “Right of free travel on the seas? Why not right of free travel on land in war territory?” Some of Wilson's advisors were angry at him for sending this note, not because they wanted to stay out of the war which many wanted to enter as soon as possible, but instead because they believed that Wilson had committed the country to the war without extracting any possible concessions or prizes from the Entente, much like what Italy and Romania had done. While this was true, it would not end up being a problem because the Germans would back down after another bit of arguing between their civilian and military leadership. The result of this would be a return to pure cruiser rules without exceptions around the English channel or time of day. This was enough to calm down the Americans, at least for the moment. The Germans were also hoping that by making this concession they would be able to convince the Americans to use their influence and power to condemn the British blockade, to if not end it completely at least allow the flow of humanitarian goods to be allowed through. They believed that the United States would do this, they would be very disappointed. An interesting incident happened on April 25th. It was on this day that UB-18, commanded by Otto Steinbrink, came upon 4 British submarines a few miles from Yarmouth. These subs were running on the surface and Steinbrink took advantage of this to fire on the one in the lead. The lookouts on the submarine saw the periscope just in time to take evasive action, and instead of turning away from the attacker they turned toward UB-18. The goal of the sub, with the designation E-22, was to ram the German attacker. The UB-18 quickly dived out of the way and then came back up to periscope depth after the British sub had missed. Steinbrink saw that the British sub was turning to make another run and quickly turned the UB-18 and shot off two torpedoes. The second one hit the British sub and the E-22 sunk quickly with only 2 survivors able to escape. It was at this moment that the UB-18 decided that it was time to cut and run. They raced for where the E-22 sunk, picked up the two survivors, and then proceeded at flank speed on their way back to their home port in Belgium. I think this story is interesting because it does a good job of showing what the submarines were doing outside of stalking and sinking merchant ships, even if that was most of what they did. Another activity of the U-Boats was taking place several thousands of miles away. Most of what we have discussed, and much of what we will discuss, around German U-Boats happened in the North Sea, the English Channel, and the Western Approaches. However, there were also some German subs that made their way all the way across the Atlantic to America. The first of these was U-53. This sub was loaded up with about as much fuel as it could possibly carry, including filling several ballast tank with diesel, and then was sent across the Atlantic. On October 7th at 3Pm they entered Newport Harbor. Robert Massie describes what happened next in his book Castles of Steel "The captain, Hans Rose, came ashore in his dress uniform to pay his respects to the American admiral commanding a destroyer flotilla based in Newport. Then he mailed a letter to the German ambassador and picked up local newspapers, which listed vessels in port about to sail and named their destinations. Observing protocol, the American admiral returned the visit and came on board to inspect the U-boat and admire its diesel engines. He was followed—with Rose’s permission—by many curious American naval officers, their wives, Newport civilians, reporters, and a photographer. At 5:30 p.m., observing all conventions limiting the stay of belligerent warships in neutral ports, Rose weighed anchor and put to sea. At dawn the next morning, U-53 lay on the surface in international waters off the Nantucket lightship where she began sinking ships." Once leaving the port the U-53 then proceeded to sink 7 merchant ships, including 5 British, 1 Norwegian, and 1 Dutch. It might also have been only 3 British ships and only 5 ships total, the sources seem a bit flimsy on that. All crew members of these ships were permitted to leave the ships before they were sunk, so there was no loss of life. After sinking the ships the U-52 returned home, having covered 7,550 miles without refueling, which was quite an impressive feat. We now turn to a discussion of some of the technology being used during the war but before we get there we need to look at how the British viewed submarines before the war, because it goes a long way to explaining why they had no effective countermeasures of any kind to the German threat. They knew that the Germans were building submarines before the war, as early as 1912 there were reports from Naval Intelligence that the Germans were building up to 30 of them. These were all superior to what the British had at the time because they used diesel engines and the British had not yet been able to outfit a submarine with the size of diesel necessary to power it. Up until diesel engines began to be used submarines were very limited in range and speed and because of this there was a relatively small geographical area in which they could operate. However, with these new and more efficient engines these restrictions began to change. Admiral Jackie fisher, who would be the head of the Admiralty for most of the war, would right to another member of the British government before the war that "As submarines grow and are able to keep the sea for longer periods it may become impossible to say where they not be met. They have the power to fight or to evade a fight at will, so that they can pick and choose their prey and can remain a constant and harassing menace to all surface craft, which at present it appears impossible to remove. Men of war will have to take the risk which decreases as the distance from the enemy’s bases increases and which will be greatest in enclosed waters such as the North Sea, Mediterranean etc. IT WILL BECOME INCREASINGLY DIFFICULT FOR ANY OR EITHER POWER TO OBTAIN COMMAND OF SUCH SEAS AS THESE, IN THE ACCEPTED SENSE OF THE TERM; IT WILL RENDER THE DESPATCH OF EXPEDITIONARY FORCES ACROSS THEM A MORE AND MORE HAZARDOUS BUSINESS THAN IT HAS BEEN BEFORE, AND THIS APPLIES EQUALLY TO THE INVASION OF ENGLAND OR TO THE DESPATCH OF OUR EXPEDITIONARY FORCE OVERSEA. CONSIDERING THE SAFETY OF ENGLAND IT WOULD THEREFORE APPEAR THAT THE DEVELOPMENT OF THE SUBMARINE (PROVIDED WE KEEP AN EQUAL OR LARGER NUMBER THAN PROSPECTIVE ENEMIES) WILL RESULT IN INCREASED SAFETY." Fisher would lead the charge in recognizing that the Germans subs could be a threat during a way, but that just makes it more confusing for why the British had not worked out a counter, especially around submarines attacking ships while submerged. Most of the Royal Navy was led by men from the 19th century and they believed that 19th century ideals and norms would be held to in the event of war. Or it might be more accurate to say they believed that Victorian era norms would be held to, I doubt there were many courtesies extended around the waters around Europe the last time the continent was at war a century earlier. With these beliefs, and the beliefs that the Germans would stick to international law, the British chose to neglect research for how to strike at a submerged vessel and instead would engage them when they surfaced. Many historians look very harshly on these decisions, and in this case I cannot blame them, especially when I remember that many of these same men had at least some idea of the plans to blockade German during a war, which would go against the very same international laws that they wanted the Germans to abide by. This inaction ended during the war and over the course of the last several years of the conflict anti-submarine technology would grow in leaps and bounds. When looking at the countermeasures used to try and stop submarines it is somewhat remarkable that there was not a specific committee or group within the British government dedicated to fighting submarines until almost the end of 1916. At this time the Anti-Submarine Division was created and put under the charge of Rear Admiral Alexander Duff. Up until this point there were very few ways to deal with submarines and most that had been sunk had been attacked by the Royal Navy while they were on the surface. This generally involved guns mounted on merchant cruisers or other warships. There had been other attempts to get the submarines tangled up in nets or cables or to hit them with mines. Both of these methods had worked to one degree or another but they never caused the number of losses that were desired and often ships had to resort to the oldest trick in the naval tactics book, ramming. The number of losses in merchant shipping during 1916 and 1917 added new urgency to the search for a true countermeasure to a submerged submarine. This would all begin with figuring out where the submerged sub was, which is where hydrophones came into play. Hydrophones were listening devices which were submerged in water and could hear the sounds of an underwater submarine. Early versions of hydrophones were available as early as 1915 and under perfect conditions they could detect a submarine up to two miles away. This distance, and its ability to work in less than optimal weather, would only improve over time as new versions were refined and produced. Figuring out where the subs were at was only have the battle, and there was also the question of sinking them, and to accomplish that task the depth charge came onto the scene. Early depth charges were about as simple as you could get, they were just metal barrels packed with 300 pounds of TNT and a pressure fuse that would allow it to detonate at a preset depth. We know that this would eventually be the ultimate answer to the submarine threat during both world war, but in the later years of the first world war they were not produced in the quantities necessary to completely rid the seas of the U-Boats. In July 1917 just 140 were being produced per week, and by the end of the year that had only increased to 800. This was not a huge amount, but it did allow destroyers, who launched the depth charges by rolling them off the steam of the ships, to sink 19 U-Boats in the last 10 months of the war. Even with these technology advances like hydrophones and depth charges action involving them would only account for 30 of the 178 U-Boats lost to enemy action during the war. Mines, which would either be cabled down at a certain depth, or just free floating and placed in known travel paths, would destroy 41. The other 198 U-Boats which were lost were destroyed in far less technical ways either by ramming, underwater nets, or during surface actions. While the British were developing countermeasures the Germans were also innovating. Their U-Boats got bigger, faster, and had greater endurance during the war but they also made some advances in a very different direction. One of these directions would result in something called U-Cruisers. These large submarines were twice as big as normal German subs, and the first to launch was the Deutschland on March 28th, 1916. The original plan was for these massive submarines to act as submerged cargo vessels capable of evading the British blockade. They had a range of over 13,000 miles, making the trip to and from America a quick and easy distance. The Deutschland would prove them when it left Germany on June 23 with a cargo of dyes, precious stones, and mail to the United States, arriving in Baltimore on August 2. The Germans then bought up what they wanted, primarily zinc, silver, copper, and nickel, and then turned around and went back to Germany. This would be the first of two trips made to the United States by the Deutschland during 1916 both of which were huge propaganda successes, with the Germans going out of their way to make sure as many people as possible knew about the journeys. The success of these trips would lead even larger submarines to be created in Germany and the largest of these were the U-139 and the U-140, which were 100 feet longer and had a 2,500 ton displacement compared to just 1,500 for the Deutschland. These new subs were also heavily armed for action on the American coast with 6 torpedo tubes and two 5.9 inch deck guns. These cargo subs were great propaganda victories but were only a small success when it came to actual cargo carrying. Submarines were generally just too small, even the largest ones, to make a big dent in the cargo trade, especially after America entered the war. This would not stop several countries from using submarines as cargo vessels during the second world war, including the British, Germans, and Japanese. Another area for which special U-Boats were build was mine laying. The most popular of these were the UC class, of which 104 were built before the end of the war. The loss rate for these submarines would be very high since they spent so much time near the English coast during their primary job which was to deposit the roughly 20 mines that they carried in the areas of the greatest concentration of shipping. These areas would always be around the British coast because, in addition to good being shipped from overseas there were also a large number of smaller transport craft that were used to move goods around the various port cities of the British Isles. This had been the practice before the war and it continued during the conflict, and the UC class was designed to prey upon them. Once the UC submarines had laid all of their mines they would then proceed on the rest of their patrol as a normal submarine, using their torpedoes to great effect. The UC class was joined by the larger UE subs, which were also designed to lay mines. The only difference was that the UE boats were larger and had much great endurance. It was one of these UE subs, the U-75 which would lay the mine near Scapa Flow which would sink the HMS Hampshire, which was carrying Lord Kitchener. Anybody who studies military history for any length of time will tell you that one absolute truth of military units is that over time they develop superstitions, and this was certainly true for the German submariners in World War 1. Over the course of the war and as the British and later the Americans got better at anti-submarine operations these became more pronounced. By the end of the war over 5,000 men would be killed, which was half of all who served aboard the U-Boats. Throughout all of the conflict the German U-Boat sailors had superstitions around their trade. The first, and perhaps most important of these, was that a commander should never, under any circumstances, switch to a different U-Boat. The second, and one that is perhaps harder to explain, was that it was very bad luck to begin a mission on a Friday. I'm not sure what the specific origins were of this superstition but it was firmly insisted on by everyone involved. Once the U-Boat launched on a mission, on any day but a Friday, the life aboard a U-Boat was tough. The constant strain of combat operations, especially as the danger began to mount, was telling on the men. Baron von Spiegel would say that ‘submarine men were likely to break down with nerve strain of some kind or other and were constantly being sent away to recuperate. The ordeal of life aboard the U-boats, with the constant stress of peril and terror, was too much for human flesh to bear for long stretches. Some men went mad. Others, after periods of rest and medication, came around and were, or perhaps were not, fit for undersea service again. All felt the grinding pressure.’ However, even with all of this stress and mental strain, the U-Boat crews mostly kept it all together during the war, and there were several reasons for this. First of all there were very few volunteers in service on submarines until 1918. Instead men were brought out of various technical trades and sections within the army and made a part of the Submarine section. They were mostly chosen for their technical skills, instead of more ephemeral qualities like patriotism. After they were enlisted in the service they were thoroughly trained. For most of the war they received over twice as much training as an infantry who was sent to the front. Then if they were assigned to a new U-boat, instead of being joined by an entire crew of green recruits experienced sailors were brought in to make up part of the ships complement. This helped to spread the valuable experience that the veterans had earned on earlier voyages. Once they arrived back in port after an operation the U-Boat crews were also treated like they were an elite branch of the navy. This meant better pay, with an additional 1.5 marks for diving pay, to be paid out for every day that the U-Boat was submerged. They also received larger quantities of leave, which of course they could only take advantage of while in port. The final key to the resiliency of the men in the U-Boats was how tight the cohesion was among those on the boats. These men spent long periods of time in training or on operations and during that time they had to depend on both themselves and everybody else in the crew, or they were dead. This forced a mutual trust and overtime confidence developed among everyone involved. This then fostered teamwork and the feeling of being part of a team, which is always a great way to motivate individuals. That is not to say that every U-Boat sailor coped with the strain well, many did not, and even those that did would be greatly tested in the last year of the war. Next episode we will see how these U-boats would be used in 1917 and beyond because in 1917 the Germans once again tried to decide if it was worth the risk of unrestricted submarine warfare.